This month marks the 20th anniversary of the first WWE King of the Ring pay-per-view, which ran every June for 10 years until it was replaced on the WWE pay-per-view calendar by Bad Blood (which has long since dissepared) in 2003. KOTR was one of the most unique and significant events in the WWE, playing a critical role in the federation’s yearly booking plans. 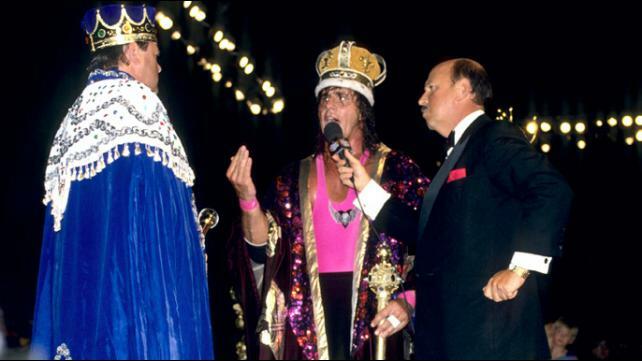 It’s hard to imagine today, but before KOTR debuted in 1993, there was only four WWE pay-per-views per year. Four! Each played a pivotal role. Royal Rumble in Janurary set up the WWE’s version of the Superbowl, Wrestlemania, in April. SummerSlam didn’t take place until August, meaning it served as the pay-off for some truly epic feuds that built over months. Surviovr Series in November stood up because of it’s unique four-on-four or five-on-five elimination match format. About 3 months separated SummerSlam from the Survivor Series. It was two months between Survivor Series and the Rumble, and about two and a half months from Rumble to Mania. The gap between Mania and SummerSlam, however, could be as much as 20 weeks. Even in the late 80s and early 90s, when WWE produced a fraction of the original programming they do today, it was hard to keep things fresh for such a long duration. In some cases, this meant that wrestlers would not be placed in any meaningful angles until the summer. In other cases, the big feuds that carried WWE through the spring would not get a PPV climax, and thus, often not get a satisfactory resolution. From that perspective, KOTR provided a much-needed stop-gap between Mania and the Survivor Series. Furthermore, it stood out from the other PPVs because of its original format — eight men battling it out in a one-night single-elimination tournament to be crowned KOTR. This wasn’t a championship belt that might be lost on the next PPV or supercard. KOTR was a title the winner would hold for the next 12 months, and it would regularly be incorporated into their gimmick, often to great effect (see “King of Hearts” Owen Hart). In 1993, there was only three titles (world, intercontinental, and tag-team), so only four men would be holding belts at any given time. That didn’t leave many options to get guys over as main-eventers. Enter the KOTR. Simply put, it was a star-maker, and a much-needed one at that. Which is just one of the reasons it is so puzzling that WWE removed KOTR in 2003, and equally as head-scratching that they haven’t resurrected it. It’s absence is quite glaring today, when WWE needs more than ever to create new stars on a frequent basis in order to keep up with the several hours of fresh TV programming they have to crank out every week, not to mention countless more of web content, and rosters for essentially two promotions, Raw and Smackdown, to keep stocked. KOTR arguably had as great an impact, in some respects, as even the “Grand Daddy of them All”, Wrestlemania, because it made stars of mid-carders, superstars of stars, and in one instance, was the impetus for arguably the greatest evoliution in pro wrestling history. So for the rest of the month, I will be examing the legacy of the KOTR, looking at the winner of the 10 PPVs from 1993 to 2002, the impact it had on the winner’s career, and the impact the winner was then able to have on the WWE. Tags: Bad Blood, King of the Ring, Owen Hart, Royal Rumble, SummerSlam, Survivor Series, Wrestlemania, WWE. Bookmark the permalink.